The “Horoscope of Prince Iskander,” for the grandson of Central Asian ruler Amir Timur (known as Tamerlane), was produced to reflect the alignment of celestial figures upon his birth on April 25, 1384. Like NASA’s modern chart as well as many other depictions of zodiacs through history, it uses a circular planisphere to represent the sky, but it divides it into 12 sections, following the Babylonian astrological zodiac. In Iskander’s time, it was customary for leaders to have their birth charts and horoscopes mapped and preserved. Iskander later supported scholarship and showed particular interest in the sciences of the night sky. Primer for January’s night sky in the northern hemisphere, this nasa star chart shows constellations including those of the astronomical zodiac. (See sidebar, below.) Each corner names zodiac constellations: Notice at top right, four appear, which accounts for the addition of Ophiuchus, in the lower left corner. When Cosmopolitan uk erroneously asserted in September last year that the us National Aeronautics and Space Administration (nasa) had updated the Western zodiac to correct for 3,000 years of shifts in star positions, astrology fans went pretty much supernova on social media. According to the report, nasa shifted the dates of the 12 signs forward by almost a month and inserted the ancient, nearly forgotten 13th sign of the serpent handler Ophiuchus in between Scorpius and Sagittarius. In reality, nasa used observation and calculation to account for the nearly infinitesimal annual shifting of our planet’s axis known technically as the precession of the equinoxes. The changes meant that for an estimated four out of five people, the sign toward which the sun was pointing at their birth was not the one they thought; rather, it was the previous one—except for Sagittarians, many of whom became Ophiucans. (This writer is now an ex-Pisces Aquarian.) Since popular astrology assigns personality traits to those born under each sign, and it predicts their future in daily, weekly and monthly horoscopes, nasa’s science felt like cosmic chaos. In a statement on its Tumblr website, nasa asserted that it was not trying to change the popular zodiac. Rather it was showing what it might look like if science and mathematics were rigorously applied. This ignited further debate about the differences between astronomy based on observable phenomena and astrology based on a mixture of observation and cultural mythology. As clear as this difference might seem, learning that one’s birth sign might be different was (and remains) unsettling to many people. The science may argue it is irrelevant, but zodiac signs have shaped the thinking and even identities of people in many lands for thousands of years. Here are 12 reasons why the zodiac’s unique mix of myth and facts really does matter. The 12-sign zodiac is part of the history of science—especially astronomy. What nasa failed to clarify was the extent to which the 12-sign zodiac is an essential part of the historical development of the science of astronomy. Western astronomers used the zodiac to measure celestial positions up until the Renaissance, when scientists adopted the equatorial coordinate system, which measures positions of celestial bodies by right ascension and declination and moving beyond the zodiac’s ecliptic-based celestial longitude and celestial latitude. 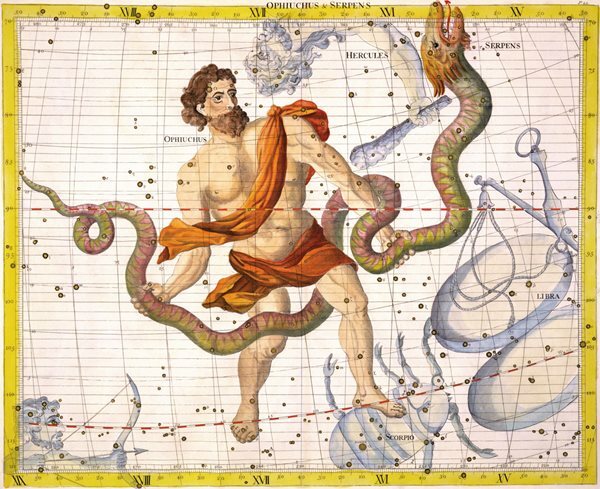 Published in 1729 from a hand-colored engraving by England&apos;s first Astronomer Royal, John Flamsteed, this plate from Atlas Coelestis depicts Ophiuchus (“The Serpent Handler”). Although one of the Babylonian zodiac’s original 13 constellations, Ophiucus was dropped for the convenience of synchronizing the number of zodiac signs to the 12-month calendar system. As the Earth orbits the sun, the sun appears to pass in front of different constellations. Much like the moon appears in a slightly different place in the sky each night, the location of the sun relative to distant background stars drifts in an easterly direction from day to day. It’s not that the sun is actually moving. The motion is entirely an illusion caused by the Earth’s own motion around our star. Sky gazers noticed this relationship between the sun and the stars from the most ancient times, and many world cultures developed zodiacs based on constellations, often with pictures of people and animals as human minds seem to instinctively “connect the dots” to tease out meaning in the patterns of the stars. The constellations of the zodiac thus are some of the earliest used markers for sailors and travelers. Even today both amateur and some professional sky-watchers rely on these constellations and others to help locate planets, comets and other celestial events. 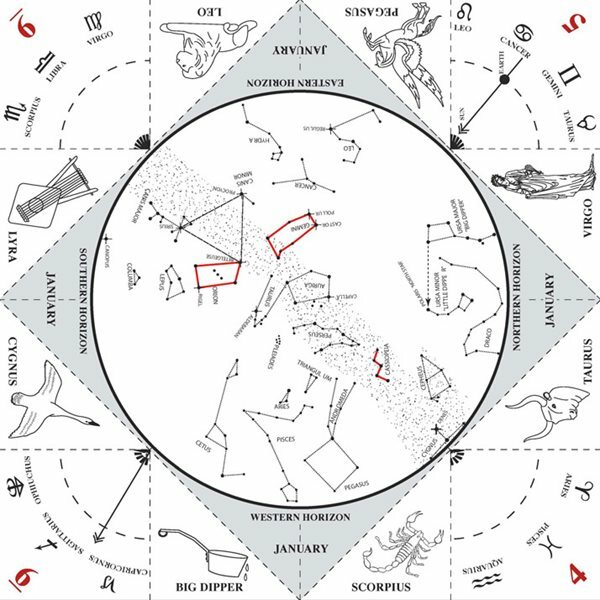 The imagery of the zodiac still appears frequently in popular astronomy and science education materials, such as the “Star Finder,” a foldup paper star locator on the nasa website that prominently features a circle of zodiac symbols. That chart includes Ophiuchus, which astronomers have long known crosses the ecliptic just like the other 12 zodiac constellations. But Ophiuchus, as a sign, was dropped all the way back in Babylonian times because, scholars say, it is the most “squeezed” of the zodiacal constellations, and to better align the zodiac with the 12-month Babylonian solar calendar, it was the easiest constellation to drop. The pattern of dots above the painting of the bull’s head resembles the arrangement of stars in either the Pleiades or Taurus (the Bull), and four more dots below the bull could also be stars. 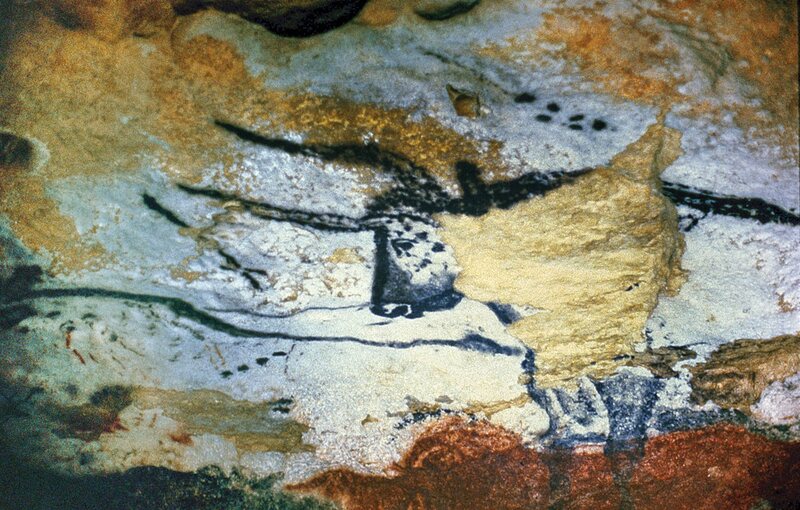 This painting appears among others in the caves near Lascaux, in southwest France, and it is some 17,000 years old. The depiction of the bull itself reinforces the interpretation that this painting may be an early zodiacal representation. If so, it then hints that some zodiac signs may long predate the Babylonian zodiac and may have been shared across great distances. The zodiac signs are part of world art and culture. The 12-sign zodiac is a significant cultural artifact. Each sign represents a 30-degree swath of the heavens. Because these signs are visual images, often with mythological stories underlying them, painters, engravers and other artists over the centuries have rendered them in art. Much of the art surrounding the Western zodiac is based on another artifact of culture: Classical Greek mythology. For example, the bull Taurus is associated with the tale of mythical hero Theseus, king of Athens, and his slaying of the dreaded half-man, half-bull Minotaur. The twins Gemini recall the story of brothers Castor and Pollux, who joined Jason and the Argonauts in their quest for the Golden Fleece. The only inanimate object in the zodiac, the golden scales of Libra, is linked to the Greek underworld’s lesser goddess of justice, Dike, and it dominates the sky during the autumn equinox, when day and night are of equal length—in balance. Inscribed in cuneiform script on a clay tablet during the second millennium bce, a Sumerian astrological calendar from Uruk (now Warka, Iraq) demonstrates the detail with which early astronomer-astrologers kept track of movements in the heavens. The development of the Greek zodiac shows us how early astronomy and astrology were joined at the hip. Many early astronomers were also astrologers—and none proved as influential as the second-century Greek polymath Claudius Ptolemy of Alexandria. Known also for his mathematical and astronomical opus the Almagest (or Syntaxis Mathematica), which inspired many early Arab and European scientists, his most widely read book is his astrological work, the Tetrabiblos (Four Books). In fact, Ptolemy’s astrological writings were so highly regarded that they were taught in European universities well into the 17th century. The Tetrabiblos laid the foundation for the Western astrological tradition. Ptolemy rationalized the planets, houses and signs of the Hellenistic zodiac and defined their functions in a way that has changed little to the present day. With a scorpion at top-center marking the autumn equinox, this kurdura—stone document—was produced in the 14th century bce, during the period of Kassite rule, the time scholars theorize may have birthed the Babylonian zodiac. Ptolemy’s Greek zodiac originated in Mesopotamia. The Greek zodiac signs can be traced back to the Sumerians, who built the world’s first known civilization between the Tigris and Euphrates rivers in present-day Iraq. From the Sumerians, the evolving idea of a zodiac passed to the Akkadians, and then on to the Assyrians and, a bit later, to the Babylonians—all before it came to the Greeks. 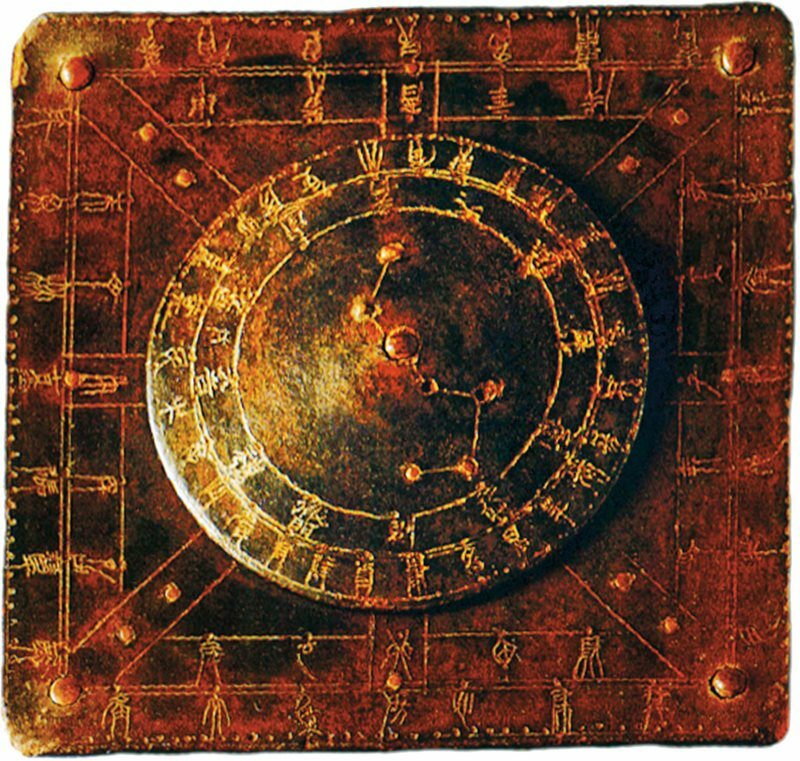 The zodiac achieved the form we know today under the Babylonians in the first millennium bce, and its origins in the region, explains Lorenzo Verderame, Assyriologist at Sapienza Università di Roma, can be traced back to the third millennium bce. How did the Sumerians develop their zodiac signs? Did they invent them or did they, too, borrow them from still older sources? The answer is probably a bit of both. 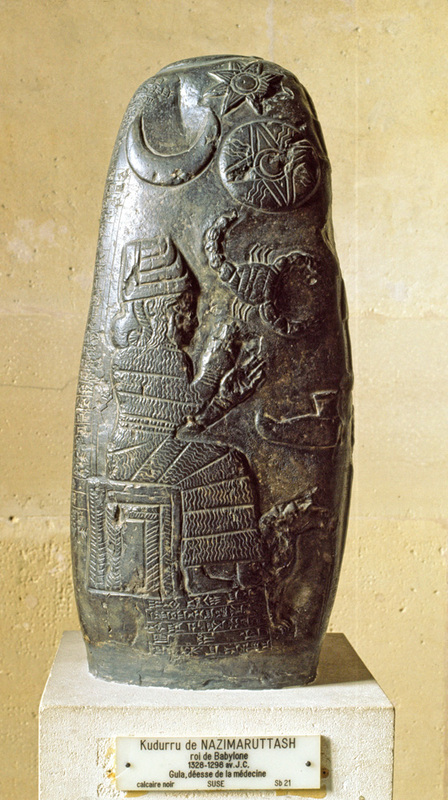 Certain examples of proto-zodiacal artwork, like the Bull and the Lion, are believed by some scholars to have come from Elam, a rival civilization to the east. Others propose that the zodiac, or at least part of it, had its origins in the early astronomy of Armenia, northwest of Mesopotamia, around 3000 bce. Ruins at the northwestern Armenian town of Metsamor, the site of a trading civilization, include three observatory platforms with engravings that suggest “zodiacal creatures,” some of which may have influenced the Babylonians. On the ceiling of the Temple of Hathor in central Egypt appears “the Zodiac of Dendera,” a planisphere comprising 12 constellations that form a Babylonian-style circular representation of the zodiac: Typically Egyptian art represented zodiacs in rectangles. We do know that about 1000 bce, Mesopotamian astronomers produced a star catalogue known as MUL.APIN (The Plough), named for its opening words. Essentially an astronomical textbook, it contains all 12 constellations of the Babylonian zodiac, along with many others. 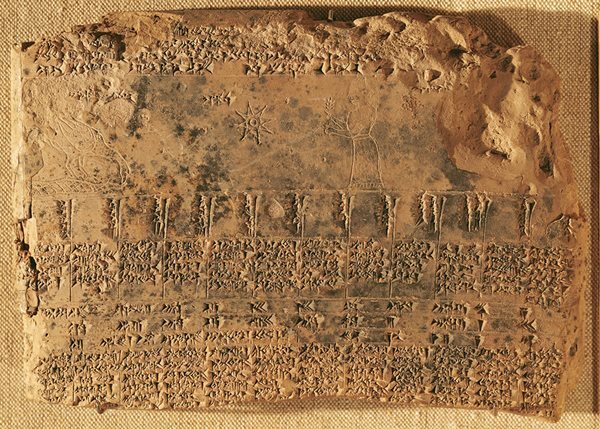 The oldest known copy of this compilation, inscribed in cuneiform on a pair of baked mud tablets, dates to the seventh century bce. The oldest zodiac imagery of all dates back to cave dwellers. Other experts are convinced that some zodiac figures are even older than Elam or Metsamor. Recent studies of the Paleolithic cave paintings of bulls, horses and other animals at Lascaux, France, suggest the backgrounds of certain paintings may incorporate prehistoric star charts. If so, this puts the origin of some zodiac figures, especially Taurus, back some 10,000 to as much as 40,000 years. From left: This planisphere, drawn by Andreas Cellarius in 1660, depicts the solar system and zodiac in the style first promulgated by Greco-Roman astronomer and geographer Claudius Ptolemy; a Korean zodiac dates from the Koryo Dynasty period, 1100–1300 ce. From top: In Aleppo, Syria, a mosaic floor of a sixth-century synagogue shows the zodiac centered around a Hellenistic sun god; a 14th-century ce miniature zodiac wheel from southern France; and the oldest known Islamic celestial globe, from the 13th century, which provided a 3-D model of the universe, complete with constellations, both of the zodiac and others. The West inherited the Babylonian zodiac, thanks to Alexander the Great. The Babylonian zodiac passed to the Greek-speaking world through the two Greek successor states of the empire built by Alexander the Great: the Seleucid empire of Mesopotamia and the Ptolemaic kingdom of Egypt, based in Alexandria. This was the “Hellenistic” period, from 323 to 31 bce, and it gives us the first surviving pictures of the Mesopotamian constellations: the Seleucid Zodiac from Mesopotamia itself and the Dendera Zodiac from Egypt. These two zodiacs, both part of a pictographic tradition, show the 12 zodiac figures plus four other animals in the zodiac style: crow, serpent, eagle and southern fish. The Seleucid Zodiac was a set of 12 clay tablets displaying the zodiacal signs for astrological use. Examples of three of the tablets survive from the last few centuries bce: Taurus with the Pleiades, Leo with Corvus the Crow standing on Hydra the Water Snake, and Virgo with her ear of corn. 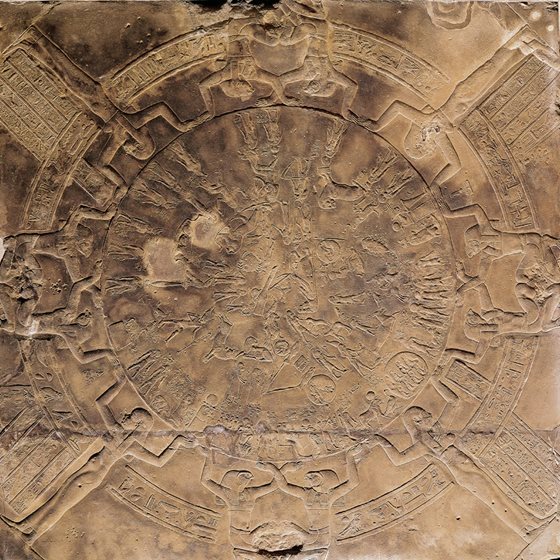 The Zodiac of Dendera, from Egypt in the first century bce, is “the only complete map that we have of an ancient sky,” says John H. Rogers of the British Astronomical Association. Preserved for us in a bas-relief on the ceiling of the Hathor Temple at Dendera, Egypt, this zodiac shows the classical zodiac surrounded by popular Egyptian constellations for the rest of the sky. Some of the zodiac figures have Greco-Roman names, and others have Egyptian names. The shapes of the figures, although produced during Egypt’s Ptolemaic era that almost universally favored Greco-Roman styles, are actually almost identical to the Mesopotamian Seleucid Zodiac and also to various Babylonian boundary-stone pictographs from the second millennium bce. Thus the Zodiac of Dendera, despite its Egyptian venue, “seems to be a complete copy of the Mesopotamian zodiac,” Rogers says. Outside the Greek sphere, zodiac calendars were rather commonplace in the Near East from the third century bce to the second century of our era, particularly among Nabataean Arabs and Aramaic-speaking peoples, including Assyrians and Hebrews. In early Islamic history, the constellations of the Arab zodiac bore names translated from Greek or Aramaic, but Ahmed al-Jallad, a professor at Leiden University, explains that the ancient Arabian zodiac has roots extending back to Babylonia. Most knowledge of the Babylonian tradition, however, appears to have been lost by the time of the Classical Islamic period in the Middle Ages. For example, the 10th-century astronomer al-Sufi believed the pre-Islamic Arabs were entirely unaware of the zodiac. Al-Jallad, however, studied the notoriously difficult Safaitic inscriptions—Bedouin graffiti carved on rocks in the basalt deserts of Syria, Jordan and Saudi Arabia—and identified all 12 zodiacal constellations, all traceable back to Babylonia. Al-Jallad showed that early Arabs did know about the zodiac, and that they had closer cultural ties with the civilizations of the Fertile Crescent than previously assumed. And the inscriptions he found were similar to those on tens of thousands of rocks amid the lava flows of present-day southern Syria, northeastern Jordan and adjoining areas of northern Saudi Arabia. The mazzaloth (“constellations”), or Hebrew zodiac, took its form between the Hellenistic and Islamic eras, and it shows a mix of influences, primarily from the Greek and Mesopotamian traditions. Its 12 representations match up with the Babylonian/Greek version in symbolism, starting point and sequence. Archeologist Rachel Hachlili, who has studied zodiac mosaics found on the floors of synagogues built in the fourth to sixth centuries, says these zodiacs, with their symbolic figures, served the local community as popular calendars that helped people remember the timing of seasonal events and rituals. This second-century-bce wooden plaque from Gansu, China, presents an outline of the Big Dipper, surrounded by constellations. Chinese astrology is based on a cycle of 12 years, and scholars debate the extent of connection—if any—to Babylonian influences. The Hindu zodiac synthesized local and Greek elements—and it is more accurate. Dating to 1500 bce or even earlier, the Hindu zodiac, too, shows Greek influences, but according to American historian of science David Pingree and others, some aspects are indigenous. The Vedas, the scriptures of Hinduism and India’s oldest literature, refer to the science Jyotisha, which involves tracking and predicting the movements of celestial bodies for time keeping. Jyotisha came to encompass Hindu astrology as well, which developed through contact with Greek learning, centuries after Alexander the Great’s military campaign in northwestern India in the fourth century bce. Science historian Michio Yano describes India’s absorption of the Greek system from the second to fifth centuries of our era as “the Sanskritization of Greek astrology.” India absorbed Greek astronomical science as well, including some elements that predated even Ptolemy. Though written and vocalized in Sanskrit, they represent pictorial images associated with the Greek zodiac. For example, dhanu (“bow”) corresponds to Sagittarius the Archer, and kumbha (“water pitcher”) corresponds to Aquarius the Water Bearer. Where they differ most profoundly, however, is in their fundamental celestial referents: The Greek system uses the tropical zodiac, in which the motion of planets is measured against the position of the Sun on the spring equinox; the Hindu system, much like the Babylonian, uses the more stable sidereal zodiac, in which the stars are regarded as a fixed background against which the motion of planets is measured. The sidereal system thus adjusts for the slight wobble of the Earth’s axis, and its measurements are more accurate over centuries. It was in about the second century that the Hindu sidereal zodiac began diverging from the Greek tropical zodiac, at the time India was absorbing Greek astronomical and astrological knowledge. Today Hindu astrology (sometimes called Vedic astrology) is alive and well, and advanced degrees in the discipline are still offered by some Indian universities. 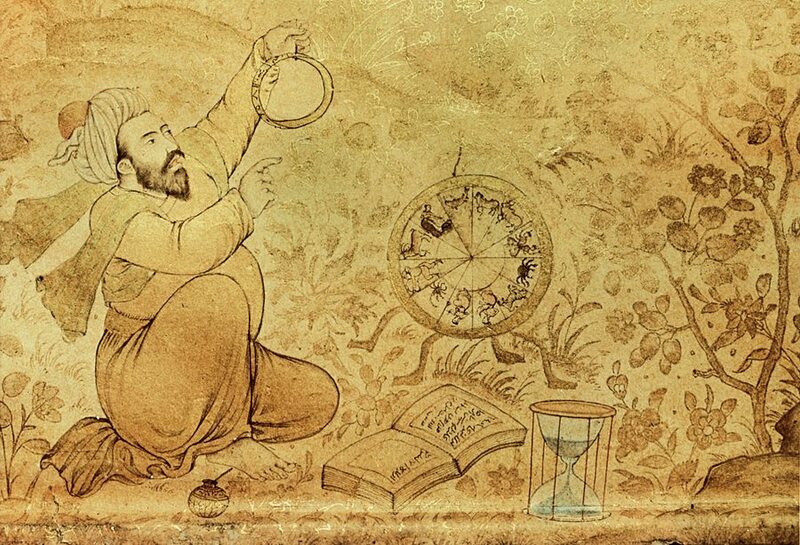 An early 17th-century Mughal drawing shows an astrologer with an astrolabe, zodiac tables and hourglass. Chinese astrologers based their zodiac on the orbital intervals of Jupiter. At the same time, China’s zodiac is unique because it covers 12 years rather than 12 months. The zodiac covers a 12-year span because of the special place that the planet Jupiter held among early Chinese astronomers, who called Jupiter the “Year Star” (“Sui-xing”). In about 2000 bce, it was Chinese astronomers who first confirmed that Jupiter takes 12 Earth years, or one “Jupiter Year,” to orbit the Sun. By the fourth century bce, the Chinese divided the sky into 12 zodiacal regions, with Jupiter passing through one region each year. An ideal time for knowledge-sharing on zodiacs and similar topics between Mesopotamia and China took place during the centuries of the Silk Roads, the intercontinental trade network across Central Asia that came into its own in the final decades of the second century bce. From the Chinese side, the Silk Road was encouraged by Emperor Wu, who ruled the Western Han Dynasty. Wu dispatched a special envoy, Zhang Qian, to the countries to the west. Zhang visited the kingdoms of Fergana, Sogdiana and Bactria (formerly the post-Alexandrian Greco-Bactrian Kingdom) and gathered information about the Indus River Valley of North India and the Parthian Empire. His reports encouraged China to continue its outreach in the West. Eventually the Silk Road stretched all the way to Rome, enabling Romans to buy silks and spices from China in exchange for Roman glass beads and other wares. 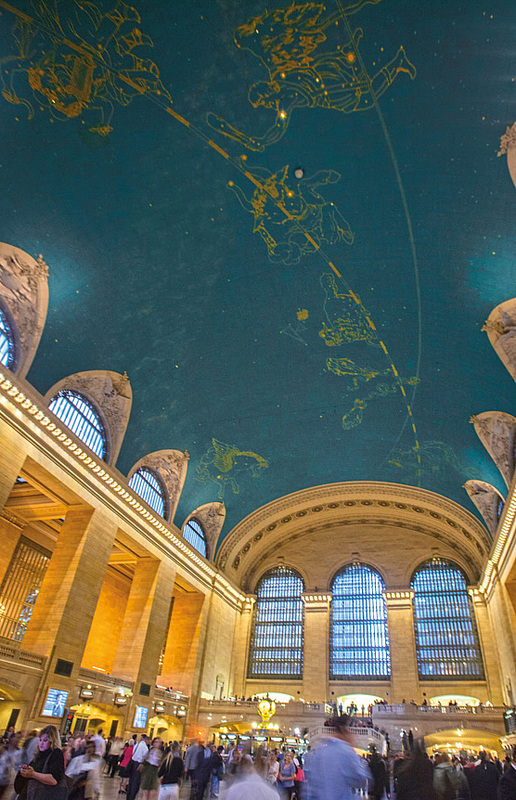 Vaulting over the main concourse of New York’s Grand Central Station, the mural of the Mediterranean winter zodiac has been restored several times since its original painting in 1913. Two important examples of zodiacs dating from the seventh to the 13th centuries appear in northwestern China: the Xuanhua Tombs of Hebei Province and the Mogao Caves at Dunhuang in Gansu Province. Diana Y. Chou, associate curator of East Asian Art at the San Diego Museum of Art, studied them. The Mogao Caves, not far from a Silk Road outpost near the Gobi Desert, were dug in the fourth century by Buddhist monks for the purpose of meditation. Created over the course of a millennium, the caves today number about 1,000, and many feature painted murals that are some of the finest of their kind in China. In Cave 61, there appears a Buddha Tejaprabha (“Buddha of the Blazing Lights”) and, in the background, the Chinese 28 astrological stars together with Babylonian astrological signs. … but there is little evidence of more than incidental influence. Although images of the Babylonian zodiac came to China in the forms of diagrams, sketches, personal accessories, vessels and other items, and even considering Chinese astrologers were doubtless familiar with the Babylonian zodiac, scholars today believe that Chinese astrology was largely immune to outside influence. Yet the similarities are too intriguing to ignore. For example, both Western and Chinese zodiac signs are ruled by elements. The Western zodiac divides its signs according to the four classical Greek elements of fire, earth, air and water, and the Chinese zodiac divides is signs into five elements of fire, earth, water, wood and metal. There are also some similarities in the roles the zodiacs play in developing personal astrology charts. Coincidence or influence? That’s a subject for future scholars. Robert W. Lebling ([email protected]) is a writer, editor and communication specialist who lives and works in Saudi Arabia. He is author of Legends of the Fire Spirits: Jinn and Genies from Arabia to Zanzibar (I.B. Tauris, 2010 & 2014), and he is co-author, with Donna Pepperdine, of Natural Remedies of Arabia (Stacey International, 2006). He is a regular contributor to AramcoWorld. Kitty Yin Ling Miao, Ph.D., is an artist, poet and scholar who lives in California and specializes in ancient Chinese bone and turtle (or oracle bone) script. She is author and artist of Brush of the Cat (artpalpitation.net, 2015).